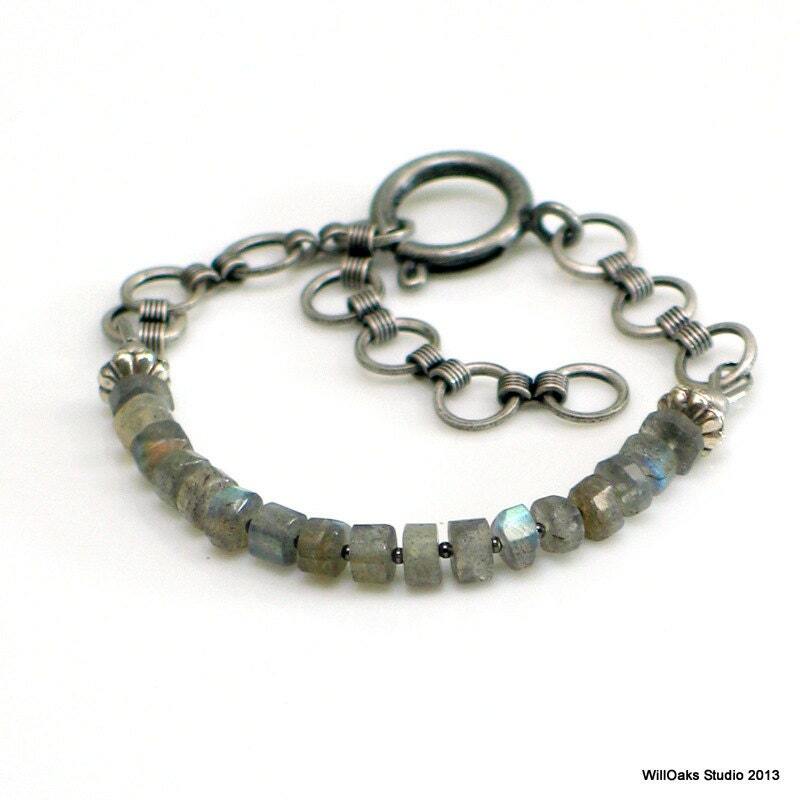 Colorful flashes of color from deep in the labradorite stones animate this gray gemstone bracelet. 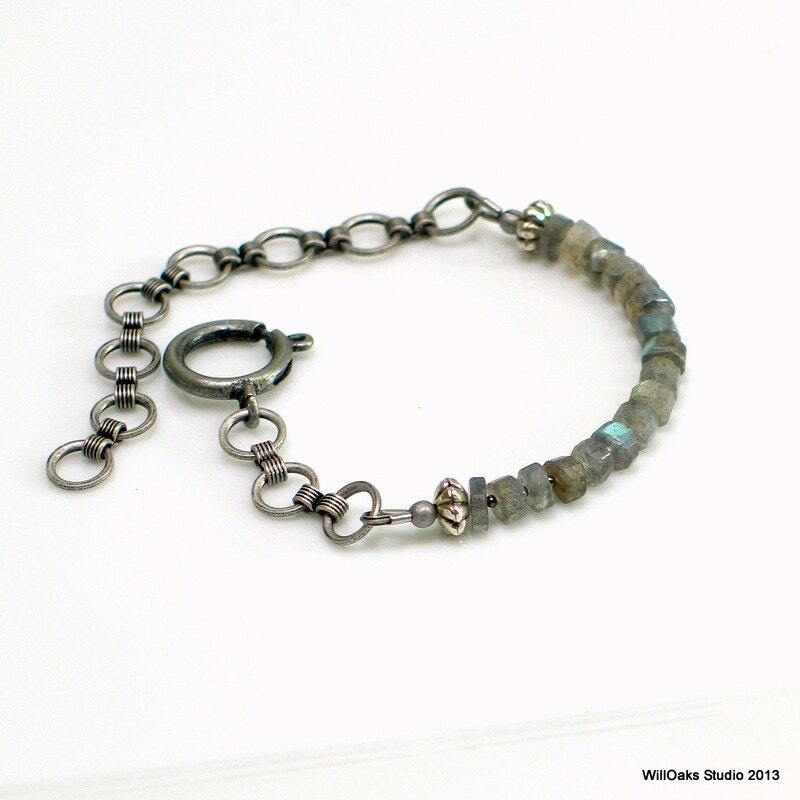 My original bracelet features a 3" row of faceted heishi beads, each separated with a tiny metal bead, counterbalanced on your wrist by a gray metal chain and oversized spring clasp. Fully adjustable from 5.5" to 8"
Antique silver finished brass chain and clasp allow this bracelet to be adjusted from about 5 1/2" to 8" simply by hooking the oversized clasp on different links (any extra chain can be captured with the clasp, left to dangle, or even removed if desired.) 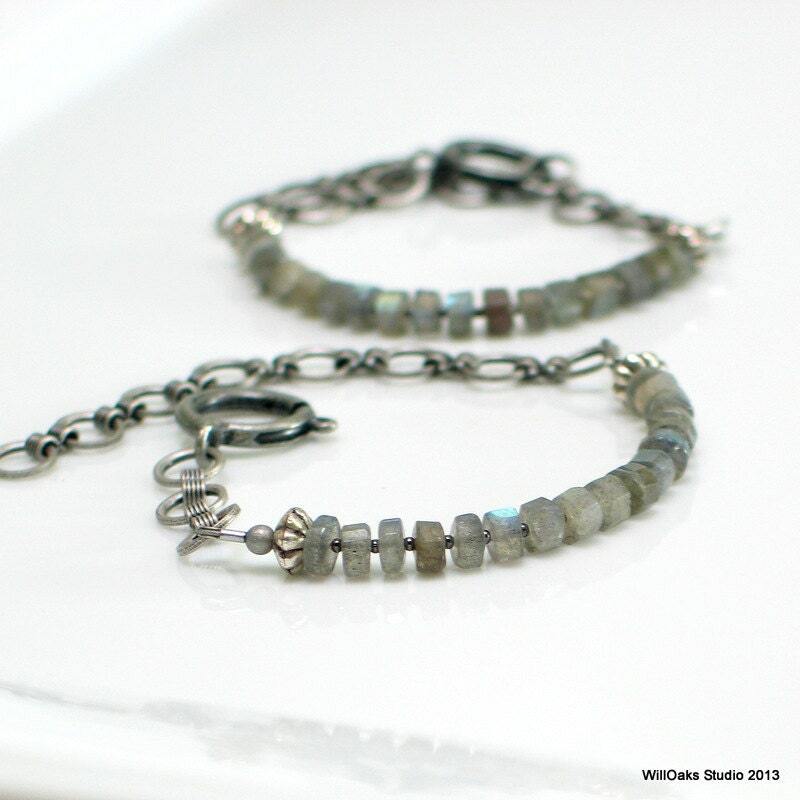 Wonderful alone or stacked with other bracelets. A gray bracelet that will coordinate with everything. The colors will flash on catching the light, from within, these slightly rustic cylindrical beads are each about 6 mm in diameter. 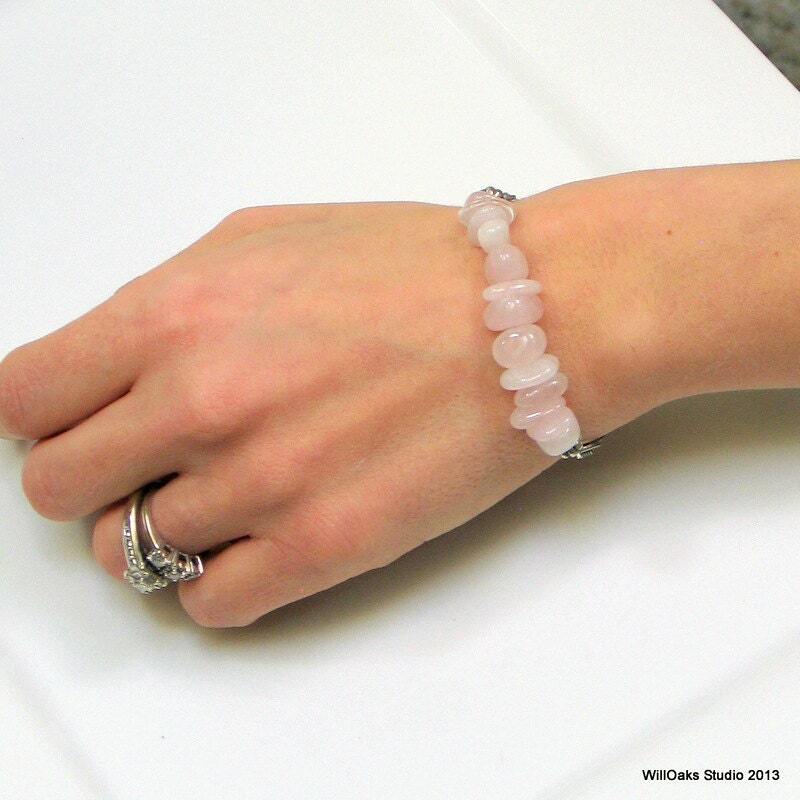 A perfect affordable gift for yourself or for a special someone on your list as this bracelet can be dressed up or down. Bracelets are sent via first class mail in either a custom box or a velvet bag, all ready to give. Limited edition, made to order. Absolutely beautiful!! Very good quality, the stones are gorgeous, pictures don't do them justice. I really couldn't be happier. All messages we responded to very quickly, the best customer service. Thank you so much for everything!!! This is a beautiful bracelet! 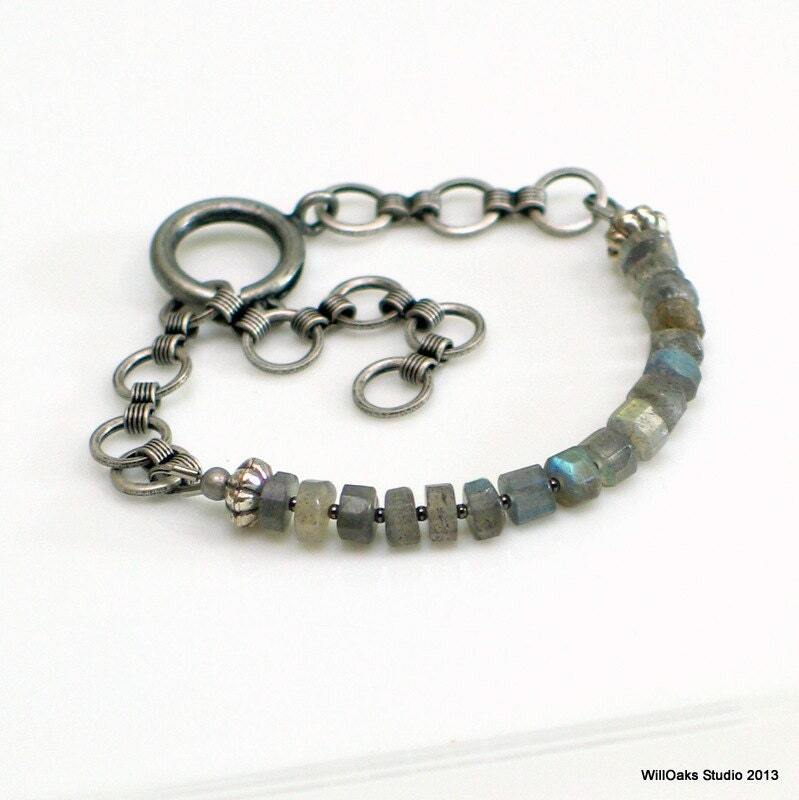 The labradorite stones with the gray chain links are stunning. Very unique. Love the adjustable feature, too. Perfect! I highly recommend this site for artisan jewelry. Thanks so much! Love the bracelet 💕 the colors indoors/outdoors of the labradorite are gorgeous. Thank you.